How to create a flow from scratch on Zoho Flow? 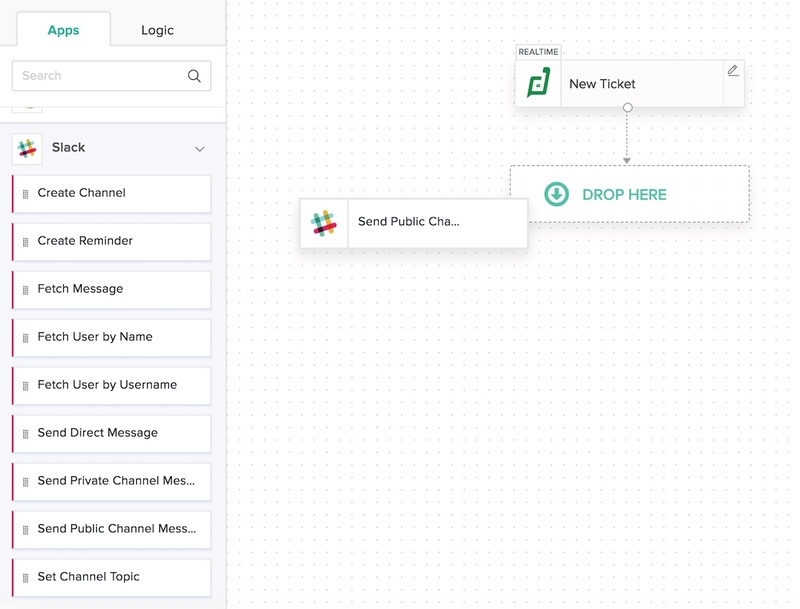 Create and customize a flow from scratch to solve your automation needs. In the My Flows section, click Create Flow in the top right corner, or the + button on the left. Enter the flow name and a description (optional). Click Create to be directed to your builder screen. 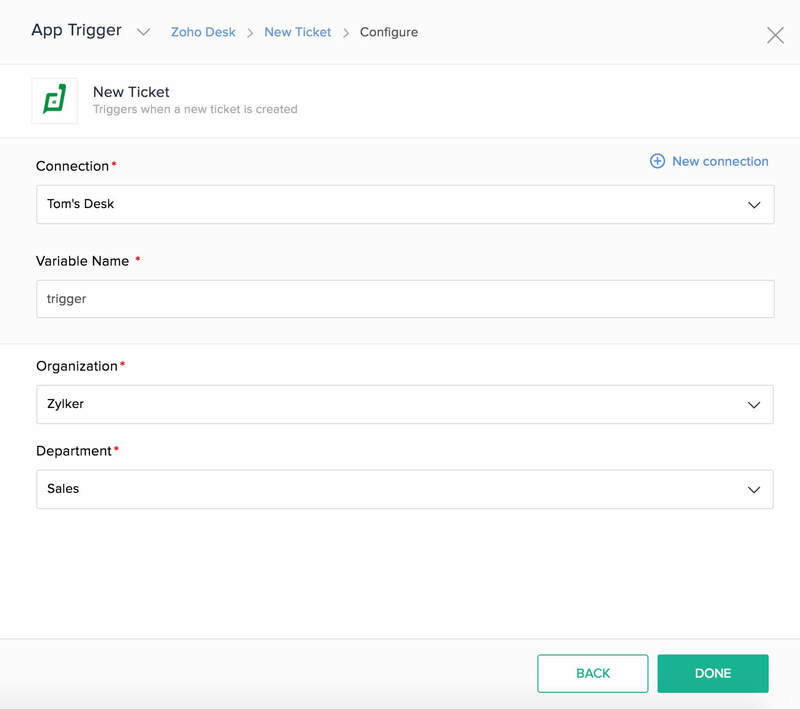 Click Configure in the App trigger box. Pick an app to trigger your flow and click Next. Choose the event in the app to trigger your flow and click Next. If you have not created any connections already, click Connect. If there are existing connections, you can choose to create a new one by clicking New connection. 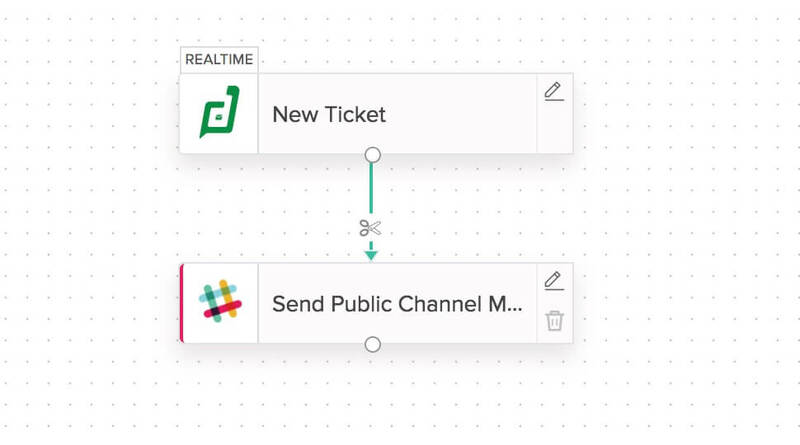 Once you create a connection, it can be used for various flows in your organization. Note that different apps have different authentication methods. If you would like to choose an existing connection, pick from the dropdown. All names must start with a letter. Variable names can contain alphanumeric characters and underscores. Other characters, such as spaces, are not accepted. Names must be unique to avoid naming clashes. Enter data in the fields that appear. Note: There are two types of trigger that various apps support. These are polling and realtime (webhook). The polling trigger checks for data updates at regular intervals and triggers the flow. 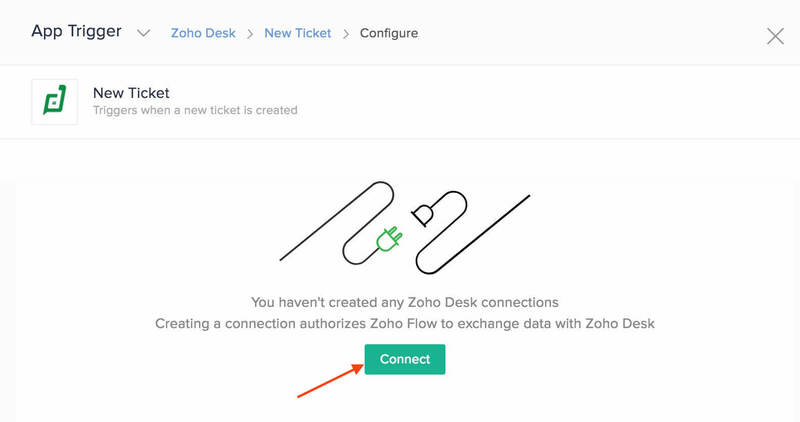 The realtime trigger initiates the flow when the trigger app pushes update data to Zoho Flow. Click Configure in the Schedule trigger box. Choose the frequency of your flow execution. You can schedule your flow to be triggered daily, weekly, monthly, yearly, or even just once. Fill in the required details like month, year, date, and time. Note: Once configured, you can change the triggers but can't delete them unless you delete the flow. You can reconfigure a trigger by clicking the edit icon. Click the trigger type to change it. An action is a task that the workflow executes based on the trigger. Once you have configured the trigger, you need to add actions. You will find these actions (app and logic-based) to the left of your builder under the App and Logic sections. Click each app on the left of the builder to view the actions available. Drag the required action to the builder, and an indication to drop will appear. In the configuration window that opens, click Connect if you have no existing connections. The action can be edited or deleted using the icons in the right of the action. 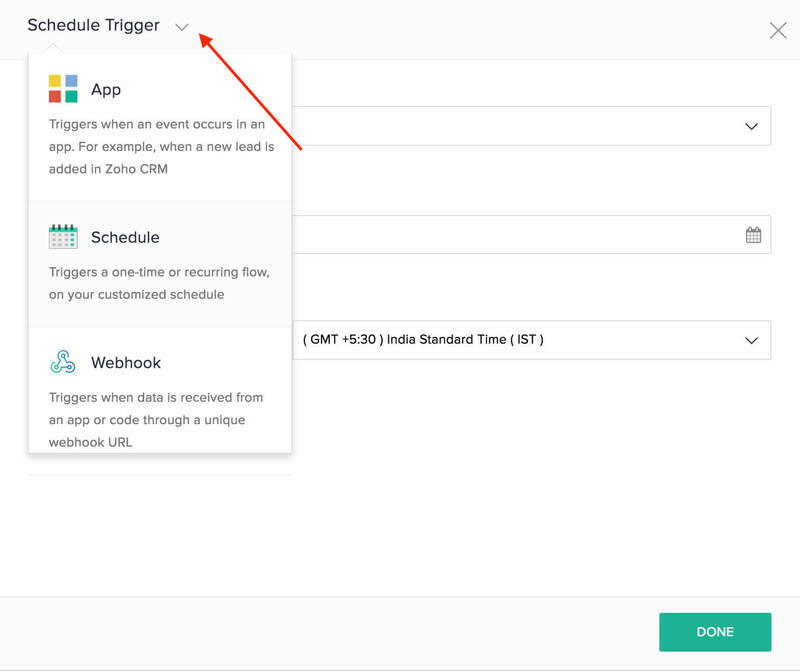 You can add links between the trigger and actions to modify the sequence of events. Click the small dot on the trigger or action and drag to the other action. To remove a link, hover over it until a scissors icon appears and click on it. You can add as many actions as you need. If you edit a trigger or action, modify the mapped data in the next steps accordingly. Otherwise, the flow will fail. 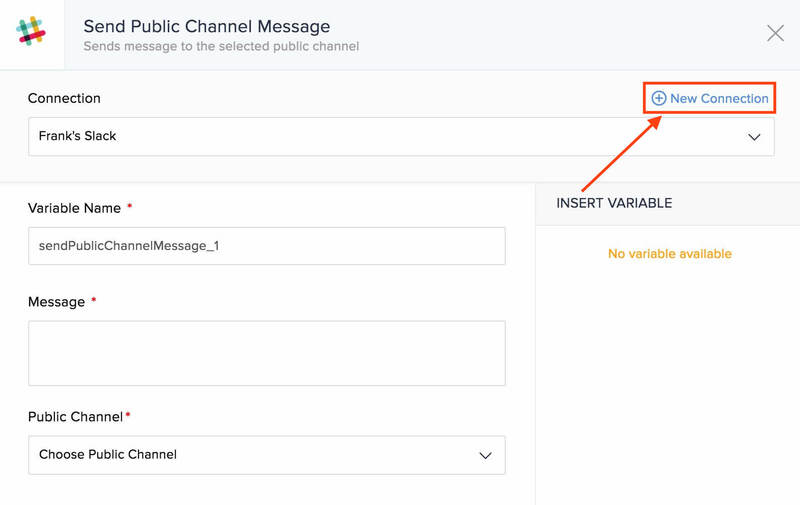 If you add fields in an app while configuring your flow, they may not be reflected as variables in the next step. To solve this, click edit on the Zoho Flow builder for the app you modified, and click Done. After creating your flow, click Save at the top of the screen. Until you switch on at least once, your flow will be saved as a draft. You won't be able to save your flow if your flow has no actions, or if an action or trigger is not configured completely. Testing and debugging your flow ensures that it is error-free. This is an optional step to check if the flow is working correctly. To switch on your flow and let it work with actual data, click the slider at the top.